In 1871, an entire fleet of whaling ships was caught in an arctic ice storm and destroyed. Though few lives were lost, the damage would forever shape one of America's most distinctive commodities: oil. New Bedford, Massachusetts, was fertile ground for this country's first multimillion-dollar industry. Founded by assiduous Quaker merchants seeking refuge for their austere religion, the town also lent unparalleled access to the high seas. The combination would lead to what would become the most successful whaling industry in America, and with it, the world's first oil hegemony. Oyl, or oil derived from whale blubber, revolutionized New England commerce. And as intrepid New Bedford whalers ventured farther into uncharted waters in search of untapped resources, the town saw incomparable wealth. But with all of the town's resources tethered to this dangerous industry and the fickle sea, success was fragile. Final Voyage is the story of one fateful whaling season that illuminates the unprecedented rise and devastating fall of America's first oil industry. 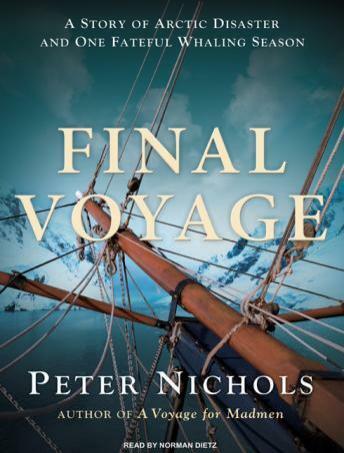 Peter Nichols deftly captures what New Bedford life was like for its Quaker inhabitants and, using a wealth of primary resources, has created a vivid picture of the evolution of whaling and how its demise was destined even before that devastating voyage.